Andrew Baldwin was born and raised in Lancashire, before moving to Hampshire in 1981 and then to Horsham in 1989. He has always been interested in politics but was encouraged to become a councillor after launching a voluntary community project to collect litter in his local area. 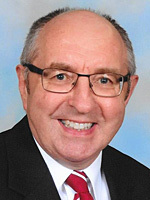 He became a member of Horsham District Council in 1999 representing Holbrook East. Andrew enjoys being able to help people sort out issues by providing them with information and making sure their views are heard and local feeling on an issue is known. His particular concerns for his area include school funding, traffic and parking. Andrew has been a school Governor at Holbrook Primary School since 1998 and has previous experience as the Treasurer for Horsham Fairtrade and as a member of the management committee of Holbrook Youth Club. Andrew has two grown up daughters, works part time as an Insurance Broker and in his spare time enjoys litter picking, tracing family history, keeping up with current affairs and travelling.